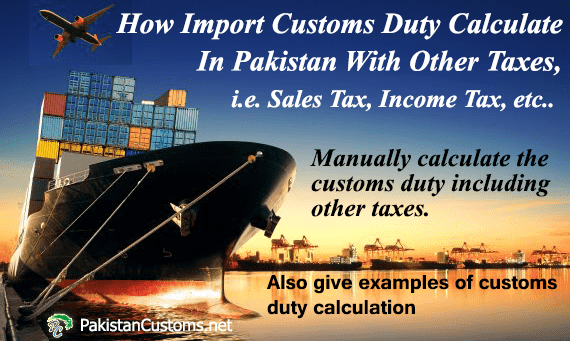 Import duty calculation manually is the quite complicated process for the new trader in Pakistan but we try to make this calculation process simple & easy, following topics we will discuss in this post. Calculating Import Customs Value of Cargo. Calculate Sales Tax of Imported Goods. How To Calculate Additional Sales Tax. Calculation The Income Tax Amount For Import Goods. How To Calculate Additional Customs Duty. Let suppose we are the commercial importer and we have imported PLASTIC GRANULES (HS Code 3901.9000) in Pakistan having CNF Value 18387 US$ now we will calculate customs duty and other taxes of this consignment. We have to calculate customs value first because we will need this value to find out import customs duty, sales tax, and income tax etc. Once we calculated the customs value of goods in Pak Rupees, so simply take customs value with the duty percentage of your products, In our example product is PLASTIC GRANULES (HS Code:3901.9000) and its customs duty is 5%. As a commercial importer, we pay extra 1% Addition Customs Duty. How to Calculate Sales Tax of Imported Goods. We will add customs value, customs duty, and additional customs duty, after adding all these values simply take 17% from this calculated value. How To Calculate The Income Tax Amount For Import Goods. To calculate the income tax amount, simply add customs value, customs duty, and additional customs duty, sales tax, and additional sales tax, once added all value take 6%. 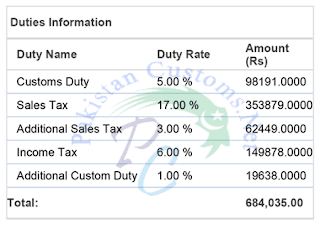 Thanks for reading this, here in this post Customs Duty Calculation In Pakistan we learned how to calculate import customs duty & other taxes manually, if you still confused or don’t understand any step discussed over here so you can contact us anytime or if you want us to calculate import customs duty of your cargo so can share your details below using comment form. How to Add Clearing Agents License Number in Weboc.